When you want to preserve the classic look of your roof, our terracotta roof repairs and cleaning services are just what you need. We carry out a thorough investigation of your property to see exactly what needs to be done. According to WorkSafe Victoria height guidelines, we're required to temporarily erect guard rails around your home while performing our terracotta roof repairs and cleaning. Working without these guard rails in place is illegal and carries severe penalties. We begin our terracotta roof repairs proper by replacing any broken or damaged tiling and inspecting water courses to ensure your roof can cope with rain or inclement weather. If we determine that your valley irons are rusted, damaged or leaking, we may need to carry out replacement works. We can easily replace your old valley with a Colorbond or Zincalum product: whichever is more suitable for your existing construction. We will then carry out a water-blasting and terracotta cleaning process to ensure your roof is spotless and free of foreign material and atmospheric pollution. This will ensure our tile treatments adhere to your tiles. Now the re-bedding process begins. We will take out the old ridge caps and get to work removing your loose cement bedding and mortar in order to have a level, straight and clean surface to install new mortar. Our team will then re-set your ridge caps, using a bedding frame for accuracy. 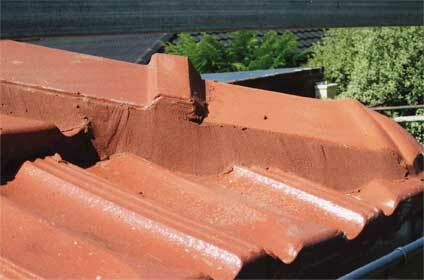 We then examine your lead flashings (if any) – fixing them up and replacing them, if needed. Next, our team will re-point your roof with pointing materials that will stick to your ridge caps without any cracking or flaking. Our pointing compound is made for this purpose. As the final step in our terracotta roof repairs, we perform a thorough gutter cleaning, removing any plant material or foreign objects that we find. During this entire terracotta cleaning and roof repairs process, we'll also take care of unused furnishings such as chimneys or flues, as well as rotted timber Dutch gables, fascias or scotia that need to be removed. 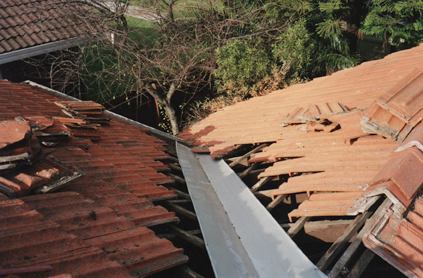 Once we're finished, your terracotta roof will look freshly-installed.